Gold fell sharply last week as the Fed reaffirmed policy tightening stance. A major chunk of that drop happened on Friday, the day after they set the stage to a 25 basis points rate hike in December. On top of that, US producer price index data for October showed an increase 0.6% versus an expected 0.2% increase to increase pressure on the yellow metal and continue boosting the momentum of the greenback. 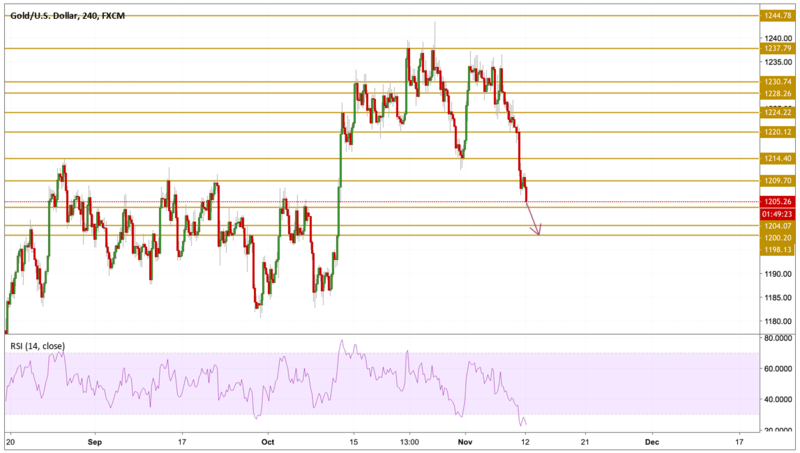 Gold prices continue to free fall breaking several support levels including the major $1214 level. The price is currently hovering just above the $1204.07 support level with very extreme oversold conditions . We expect the downward move to continue and test the support levels in this area. We will be focusing on the $1198.13 level.